I have been wondering about the difference between various types of agricultural practices, since they can have vastly dif­ferent environ­mental impacts. Conventional chemistry-based mono­cultures are easy to tell from organic cultures. But what about integrated farming, "beyond organic", biomimicry or perma­culture? where do they fit? An extra complication is that, as Michael Pollan points out in The omni­vore's dilemma, some "might appear to be preindustrial but in surprizing ways turn out in fact to be postindustrial". On top of the issues of using genetically modified organisms (GMOs) and petro­chemical fertilizers and pesti­cides, a key question is how many different crops go into fields. There are three criteria: how many together at once, how many across fields and how many across time. The use of non-crop plants involves in particular legumes (pulses), such as clover or alfalfa, to increase the nitrogen content of the soil; these are not harvested (hence "non-crop"). Here is how the four types of agricultural practices look on these criteria ("conventional" is represented by the huge mono­cultures of corn or soybeans of the US Mid-west and South America or the large European wheat mono­cultures; some conventional cultures are less extreme, for instance rotating cultures). * Assuming perennials are used. Annuals regrow from scratch (a seed) every year (e.g. wheat, tomato). Peren­nials (for instance trees) live for several years. 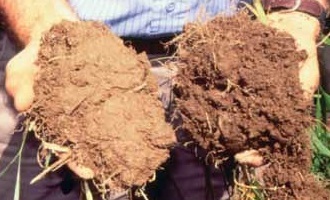 Unlike annuals, perennials have roots year-long (as shown by the image on the right), which for instance helps to hold the soil and fight erosion. The use of perennials would imply that the same crops will be used in any plot of land over time (i.e. there is no ro­ta­tion) and that no tillage is needed to plant new annuals every year. Perennials are preferred by permaculture (see for in­stance landinstitute.org). Well, they are preferred in theory, but are they actually used in practice? not yet perhaps. Nitrogen fertilization. Conventional agriculture uses chemical fertilizers made from methane (natural gas) using the Haber-Bosch method. Others shun chemicals and rely on organic fertilizers, such as compost and manure, which are added to the fields in a way similar to chemical fertilizers. Or they may instead fertilize without ferti­lizers, by growing legumes (either between crops or along with them); legumes can turn nitrogen from the air into nitrogen-containing molecules usable by plants. Pest control. The conventional way is to use chemical pesticides. The first improvement is to use insecti­cide when relevant insects are spotted rather than prophy­lac­tically. Also different insecticides may be used that are less harmful (even though this is not an exact science: copper-based fungicides, e.g. "Bordeaux mixture", favored by organic growers can be toxic to humans). Instead of replacing pesticides with "natural" alternatives, integrated methods rely on predators to the bugs (e.g. ladybugs eat aphids, on top of being prettier than a tank of chemicals). Polyculture can also help since there may not be a critical mass of the right crop for pests to thrive on. Weed control. The pattern is similar: chemicals, less chemicals, alternatives to chemicals. The last step again is relying on nature to prevent the problem instead of having to cure it; for instance, perennials are already there in the spring and have a head start on annual weeds. Integrated and organic practices involve using different plants on the same plot over time (rotation). Also at any one time several plots will have different cultures (so, regardless of the weather that year, some will not give much but other will thrive). On the other hand, permaculture tries to look more like nature by having several types of plants together at the same time. All this can be labeled "poly­culture", so this word is ambiguous. The opposite, mono­culture, unambiguously fits the can­onical practice of having only one culture (say corn or soy) on all land all the time; but permaculturists would say that crop rotation is in fact successive mono­cultures. The table does not have any poly-polyculture for two reasons. As already pointed out, it would necessarily have to be annuals. Also it would gild the lilies: having several types of plants on a plot of land either at once or in succession avoids draining the soil of a specific nutrient, avoids catastrophic epidemics, provides fertilization (legumes), etc. ; but doing both would not add anything. Hydroponics is too idiosyncratic for a direct comparison: there is no question of tillage, erosion or preserving the soil fertility. Like conventional agriculture it feeds the plants, not the soil (what soil? ), as the table below shows. There is a dif­ference between hydro­ponic green­houses, which use sunlight like the rest of agriculture, and hydro­ponics in window­less rooms (e.g. basements) where the light comes from lamps (e.g. LED). While conventional agriculture replaced natural nutrients with industrial ones, what I call hydroponic darkhouses also replaced natural light with industrial light — of course both are very resource-intensive. Apart for the absence of a lively soil, hydroponics is different from conventional agriculture: it does not need as much pesti­cide because the absence of soil disturbs weeds, insects and parasites. Mixed farming is even possible: aquaponics uses both fish and plants, like a 21th century version of the old mixed farm with crops and animals, where chicken and pigs fed on dropped grain and on leftovers, and their wastes fed the crops. A sustainable agricultural system must preserve topsoil quality (organic matter, biomass) and quantity (avoid erosion), avoid pol­lu­tion (of the water by nitrate runoffs; of the air by the green-house gases CO2 and nitrous oxide, N2O). But meeting all these criteria is not enough: if this environmentally sustainable food production is prohibitively expensive, it will be a commercial failure (and bank­ruptcy is not sustainable). So yields are important too. Moreover, nutrients (nitrogen, phosphorus, potassium) in syn­thetic form are re­leased faster than with compost, manure or legumes. There is thus a greater risk that these will end up in ground­water or rivers rather than in the plant: both a waste of money and a source of pollution. Fertilizers can also release nitrous oxide (N2O), a very potent green-house gas, and their production requires natural gas and energy — doing without them thus vastly reduces the climate impact of agriculture. According to the Rodale Institute, organic systems are more resilient: "Organic corn yields were 31% higher than con­ven­tional in years of drought [better than] genetically engineered 'drought tolerant' varieties which saw increases of only 6.7% to 13.3%". 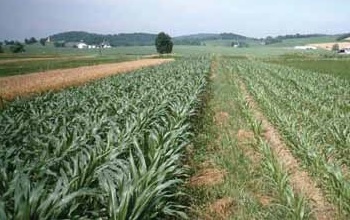 The image on the left shows that con­ventional corn (right) is suffering from hydric stress during a drought, unlike corn grown with legumes (left). Organic crops also "tolerated much higher levels of weed com­pe­ti­tion than their con­ven­tional counter­parts, while pro­ducing equi­valent yields". This is partic­ularly interesting given that a key goal of GMO crops is herbi­cide resistance, which allows to use more and more herbicide, but also creates resistant weeds. According to the Rodale Institute 30-year study of corn and soybean: "Organic yields match conventional yields" after a tran­si­tion period. Moreover, "even without a price premium, the organic systems are com­pe­ti­tive with the conventional sys­tems." (But then why is organic food more expensive?) And if the food is grown locally, it is also cheaper to transport. yield very high high lower? ?? When he describes how he designed his house, Amory Lovins explains that adding some insulation reduces heating costs enough to be economical, then further insulation costs more than it saves on energy. But with a lot more insulation it becomes possible to "eliminate the building's heating system and thus avoid the entire capital cost of furnace, ducts, [etc.]" and thus save money. With agriculture, reducing the consumption of chemical fertilizers and pesticides can be economical because it will reduce yields a little (if at all) but it will also reduce costs. However, a further reduction of chemicals, the savings may not be enough to compensate the yield loss. Yet, there is the possibility that a massive reduction would work — because even if pests are back their predators (e.g. ladybugs) would thrive too, or because the soil microfauna would be healthier. This complicates the situation because doing more of what does not seem to work may work.